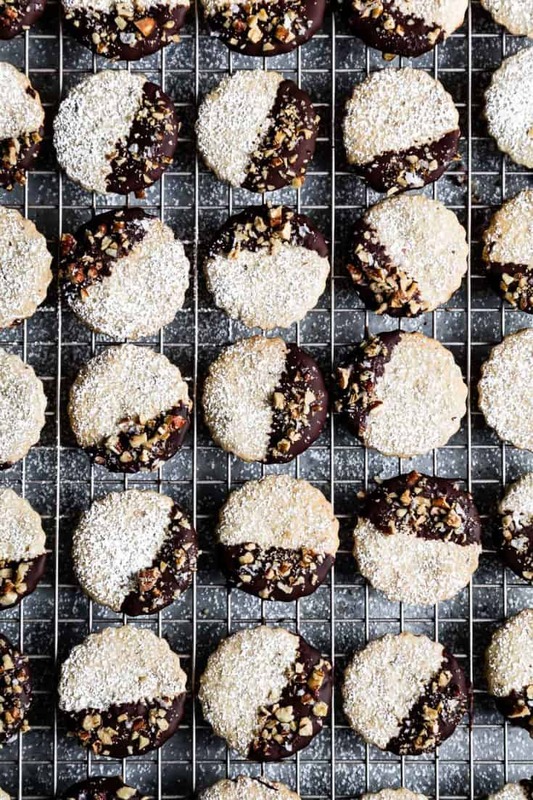 Crisp melt-in-your-mouth gluten-free pecan shortbread cookies dipped in dark chocolate. 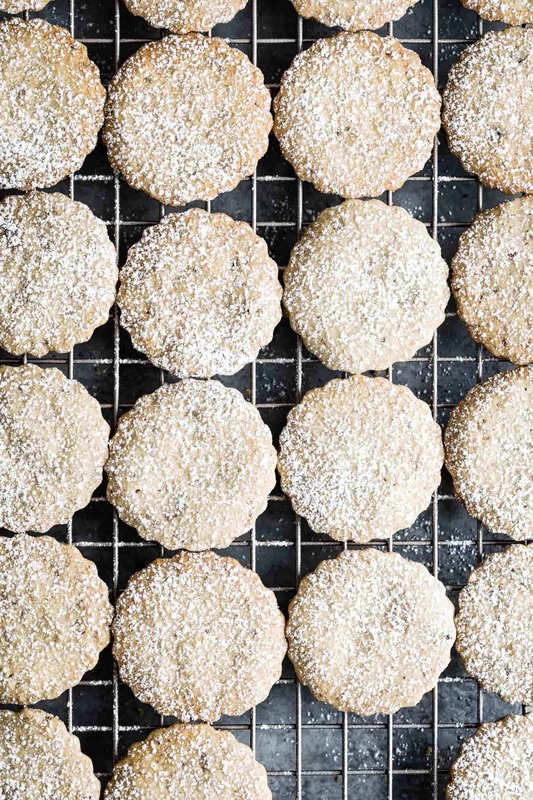 Topped with powdered sugar, toasted pecans, flakey salt, these festive cookies will be the hit of your cookie platter. This recipe is made in partnership with Diamond Nuts. Be careful – these cookies should come with a warning. 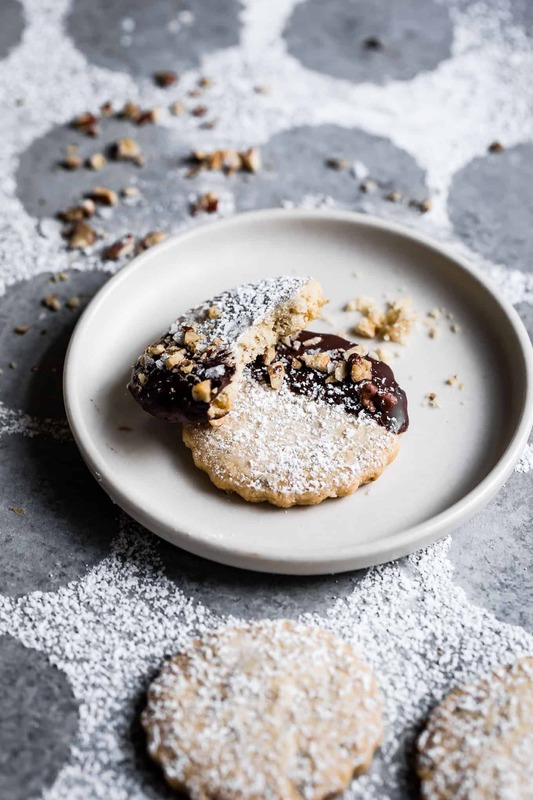 I’ve cut out these pecan shortbread cookies into little two-bite coins, which makes it incredibly easy to eat a dozen in less than five minutes. And a whole batch in less than an hour. On any normal night when I eat cookies, I portion myself to keep from recklessly eating all the cookies. When there’s a holiday cookie plate involved, though, I aimlessly grab a cookie each time I walk past the table. In my opinion, that’s how holiday cookies are meant to be enjoyed. These chocolate pecan cookies are the perfect cookie for just that. Before you know it, you’ll have eaten the whole plate without even realizing. This butter pecan shortbread recipe is the third in a year-long partnership with Diamond Nuts. All of my Diamond Nut recipes so far are great for the holidays. 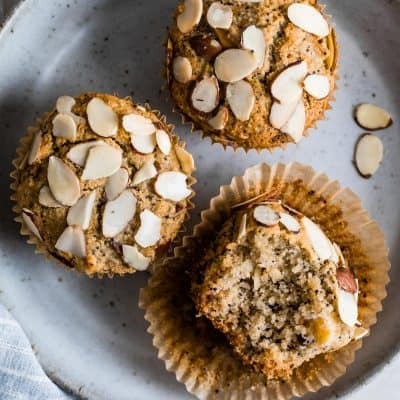 First I made poppy seed almond flour muffins – to make them for the holidays, sub in cranberries for the peaches or just leave the peaches out all together. Next I made smoky maple roasted rainbow carrots with walnuts and feta. And now, my true love: cookies. 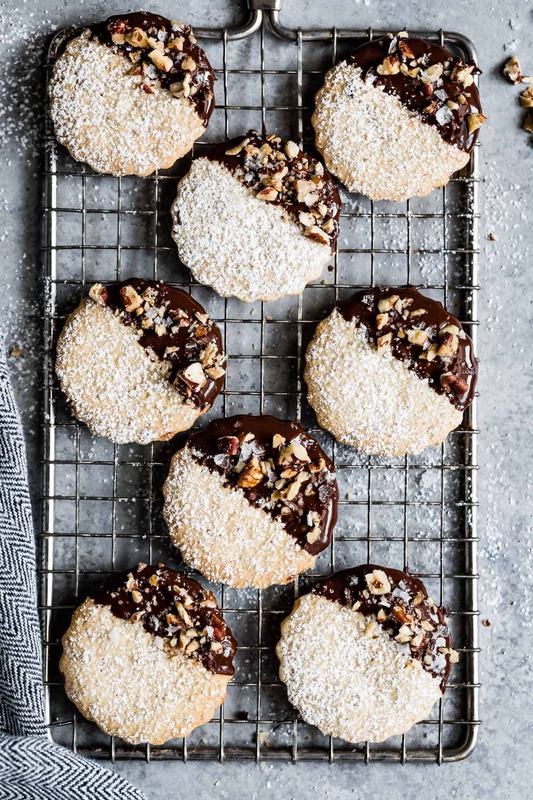 Buttery, melt-in-your-mouth pecan shortbread cookies dipped in chocolate and sprinkled with more toasted pecans and flakey salt. The other day at the market, a man and his daughter put a box of gluten-free chocolate almond cookies on the conveyor belt in front of me. They caught my eye because, well, cookies. Making conversation, I asked if he’d bought them before and if they were good. He shrugged, “I think so. We’re buying them again, so I guess we liked them.” MEDIOCRE REVIEW AT BEST. Guess what? I bought a box. He’s a hero. 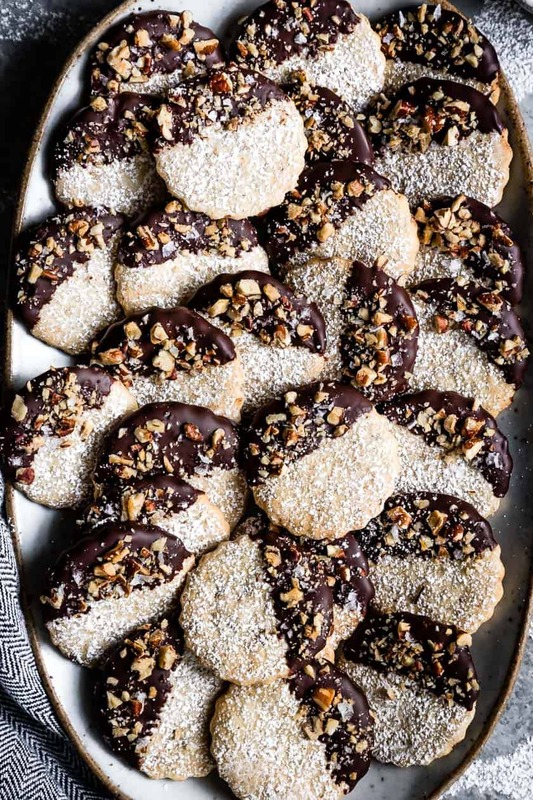 I wish I could rip open a box of these homemade gluten-free chocolate pecan shortbread cookies for you to taste right now. You’d rush to the kitchen to make a full batch. 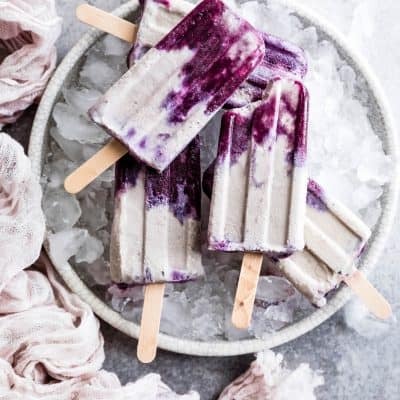 They’ve got a crisp bite while still melting in your mouth. 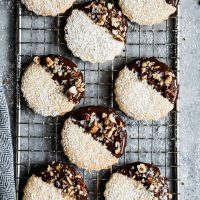 With loads of toasted pecans, they taste a lot like snowball cookies (or Mexican wedding cookies) except even better because they’re dipped in dark chocolate and sprinkled with more crunchy pecans. 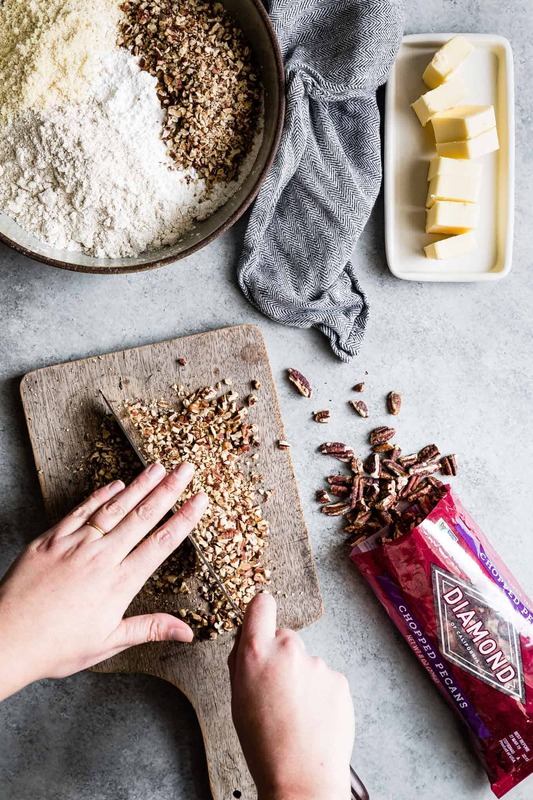 Give the pecans a quick toast in the oven before adding them to the cookies will intensify their flavor and make them crunchy when baked up in the cookies .If you skip this step, the pecans won’t get crispy while they bake in the cookies, leaving a less than desirable soft texture. Toasting takes Diamond Nuts buttery smooth pecans and gives them an irresistible depth of flavor you’ll want to put on all the things. To toast them, I take a bag of Diamond Nuts chopped or whole pecans and toast them as is. When they’re nice and toasty, chop the nuts up even more finely. Chopping the pecans up after baking will make sure any of the super fine dust pieces don’t get too toasty or burn in the oven. My favorite time-saving tip is to toast more nuts than you need for the recipe. While I’m at it, I toast up a whole bag or two of pecans at a time and then just return whatever I don’t use to the bag for later use. This method also means I always have toasted nuts on hand for other recipes (browse other recipes for pecans here!). 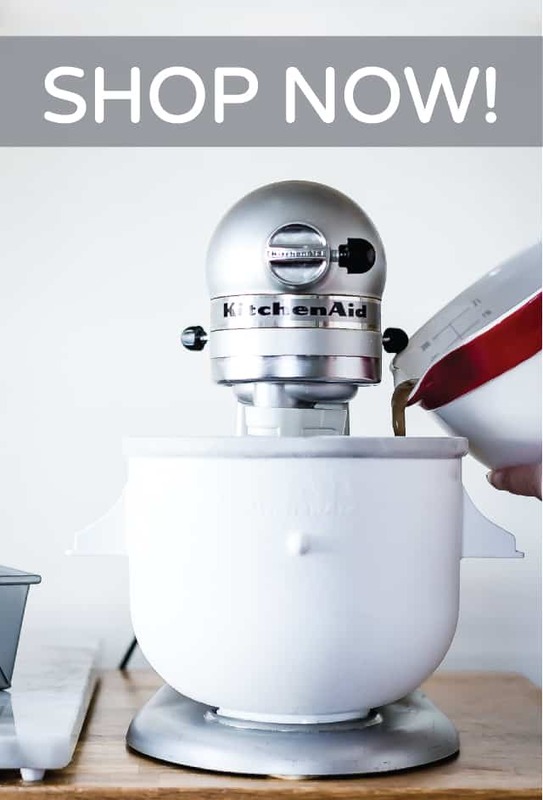 Perhaps most importantly, it ensures I’ll have enough pecans when I inevitably taste a handful before they go into the cookies. The key to getting perfectly fluted shortbread cookies without spreading is to chill the dough before baking. 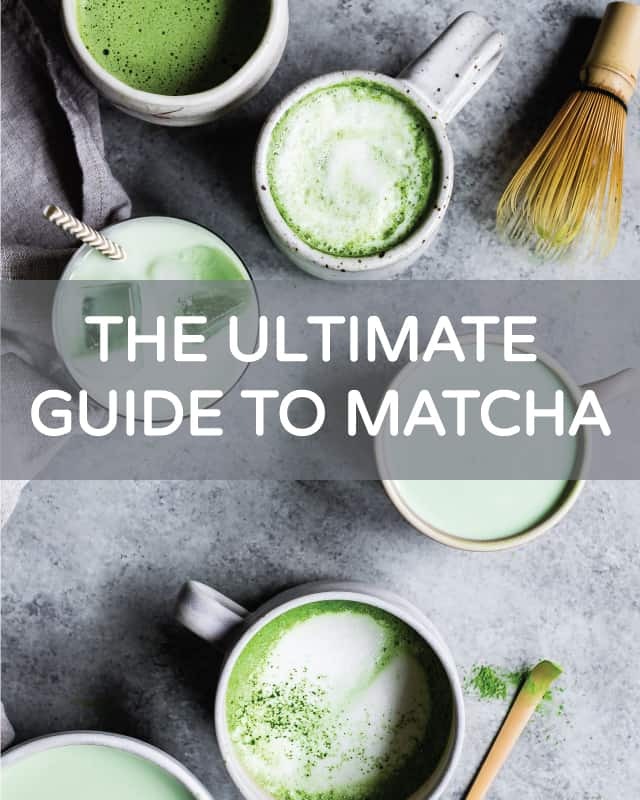 I am very impatient though and hardly ever plan enough in advance to deal with long chill times, so I’ve got two shortcuts that cut that time down significantly! Chill the dough after rolling it out. 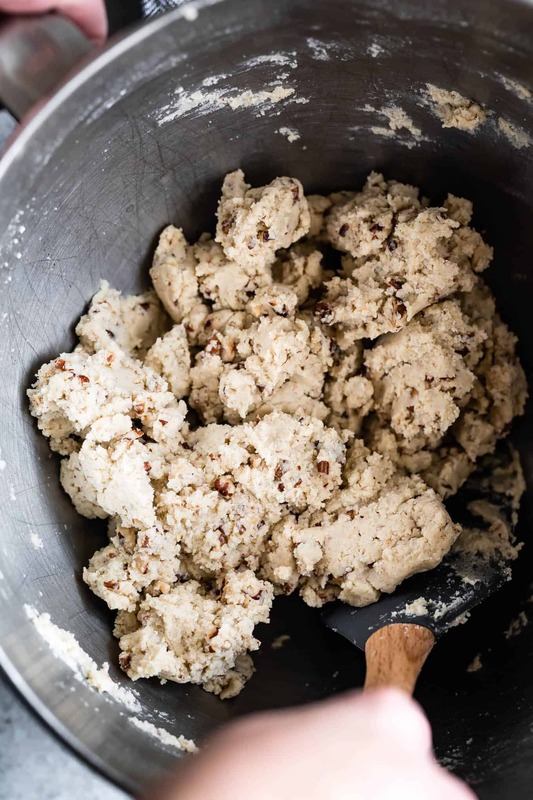 This pecan shortbread dough is not too soft and sticky. It’s firm enough to be rolled out between two sheets of parchment paper right after mixing. Slide the rolled out dough still in the parchment paper onto a baking sheet, stacking one dough oval right on top of the other. Chill the whole baking sheet. They’ll chill much faster if they’re rolled out and the metal baking sheet helps too! If you’ve got space for it, chill the dough in the freezer. I have a pretty packed freezer, but I almost always chill my dough in the freezer. I just slide the baking sheet right on top of my freezer drawer of nuts. Like I said, I have no patience. Especially when I want cookies. Chilling the dough in the freezer cuts the chill time in half. The holiday dessert table in our house always has a cookie platter with no fewer than four types of cookies on it. That’s a big commitment! Baking four types of cookies all at once? Who has time for that? Especially when you’re probably also cooking a holiday meal. That’s where making cookies in advance and freezing them comes in handy. 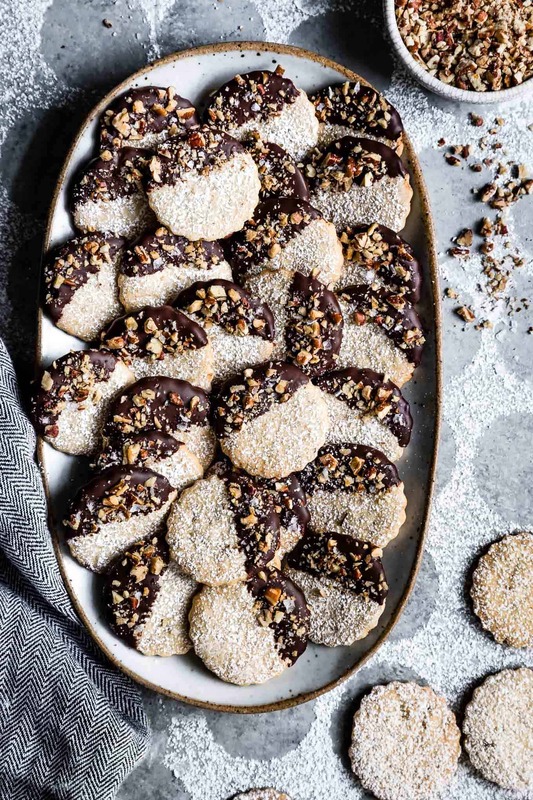 You can bake these gluten-free chocolate-dipped butter pecan shortbread cookies up to a month in advance and freeze them in an airtight container until the big day. I tested the method for Thanksgiving this year and they tasted exactly the same as the day I made them! Just let them come to room temperature for 20 minutes before serving. 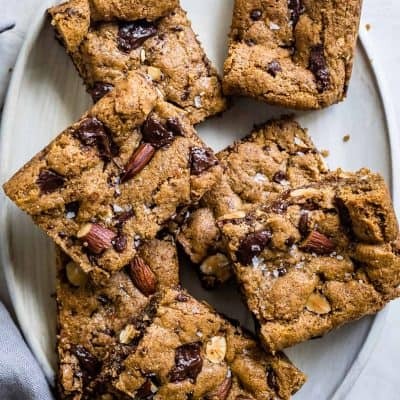 For other cookies that are best warm from the oven, you can make, shape, and freeze the dough so all you have to do is plop them on a baking sheet and bake. To keep the cookie dough balls from sticking together, put the cookie dough balls on a baking sheet in the fridge or freezer for 30 minutes before putting them in a container or bag for longer-term freezing. Then just bake them straight from the freezer. Crisp melt-in-your-mouth gluten-free pecan shortbread cookies dipped in dark chocolate. 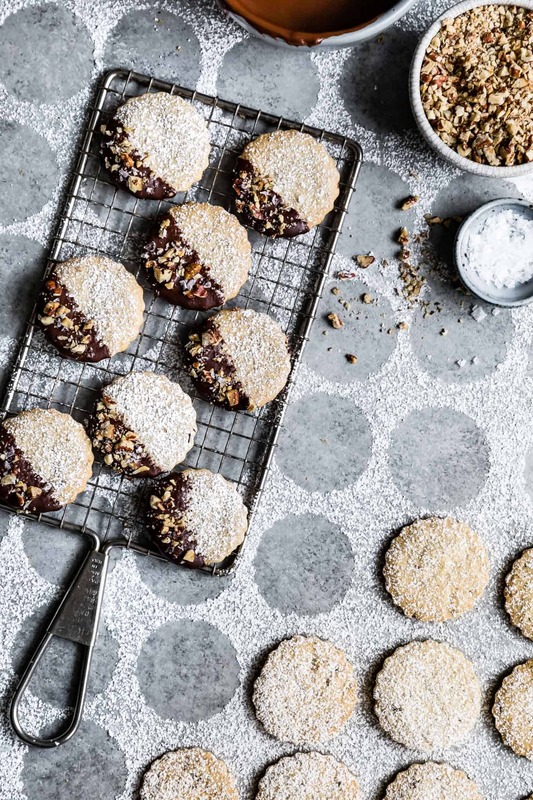 Topped with powdered sugar, toasted pecans, flakey salt, these festive cookies will be the hit of your cookie platter. Preheat the oven to 350°F. Spread the chopped pecans on a baking sheet and toast for 6-10 minutes until toasty and fragrant. 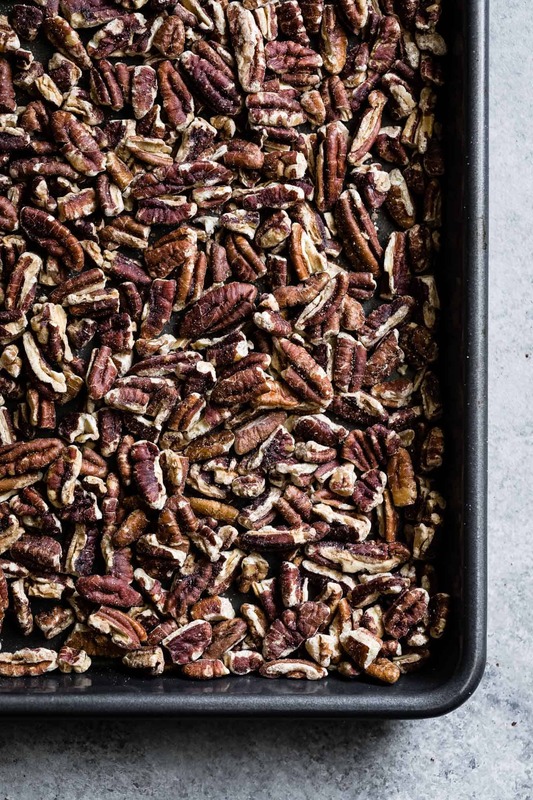 Pour the pecans onto a cutting board to cool. Once cool, finely chop the pecans - you don't want the pecans as fine as dust/flour, but the finer they're chopped, the easier your dough will be to roll out. Measure out 1/2 cup of the finely chopped pecans to put into the cookie dough. Set the rest aside for sprinkling on top. Whisk together the 1/2 cup finely chopped pecans, almond flour, oat flour, cornstarch, and salt in a medium bowl. Set aside. 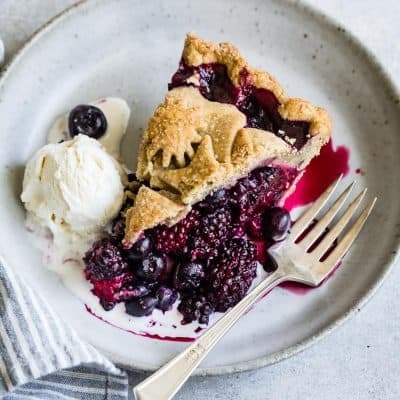 In the bowl of a stand mixer fitted with a paddle attachment or a medium bowl with a hand mixer, beat the butter on high until light and fluffy, 3-5 minutes. Slowly add the powdered sugar and beat until incorporated. Add the vanilla extract and mix until smooth. With the mixer on low, slowly add the dry ingredients to the butter and beat until completely smooth, scraping down the sides as necessary. Roll the dough out between two parchment sheets into a 1/8 -1/4-inch thick oval. 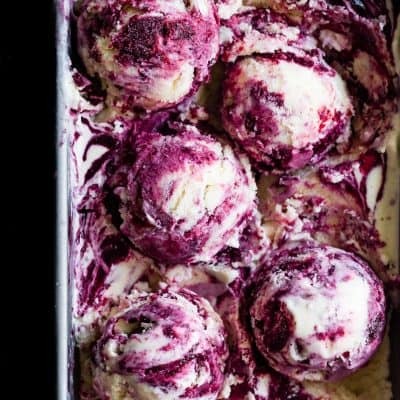 Place on a baking sheet and chill in the fridge for 30 minutes or freezer for 10 minutes. 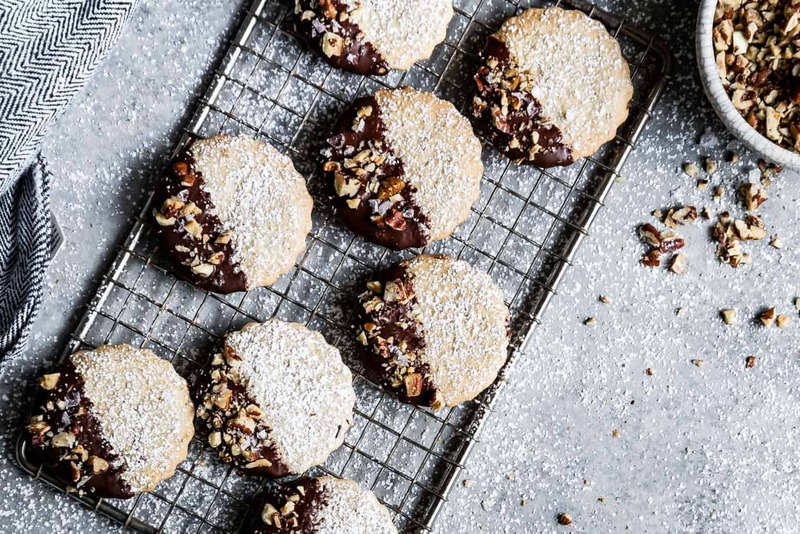 Use a 2-inch round or fluted cutter to cut out cookies. Using a knife or bench scraper as needed to lift the cookies, transfer cookies to a parchment lined baking sheet, 1-2 inches apart. Repeat, rolling out the dough again as needed. Chill the cookies in the fridge for 20 minutes or in the freezer for 10 minutes. Bake cookies, one tray at a time, on the middle rack for 10-12 minutes, until the edges just begin to turn golden. 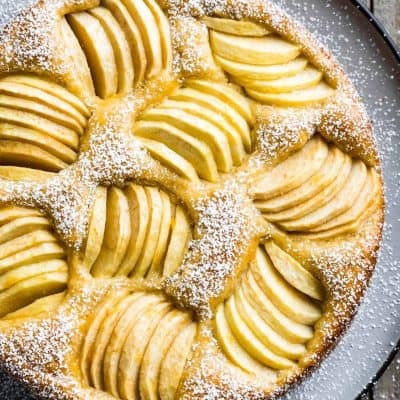 Let cool on the baking sheet for at least 5 minutes before using a fine metal spatula to transfer to a wire rack to cool completely. Repeat with remaining baking sheets. While the cookies bake, Melt the chocolate. You can melt the chocolate in a double broiler, or do as I do and place it in a small microwave safe bowl. Microwave for 30 seconds, stir. 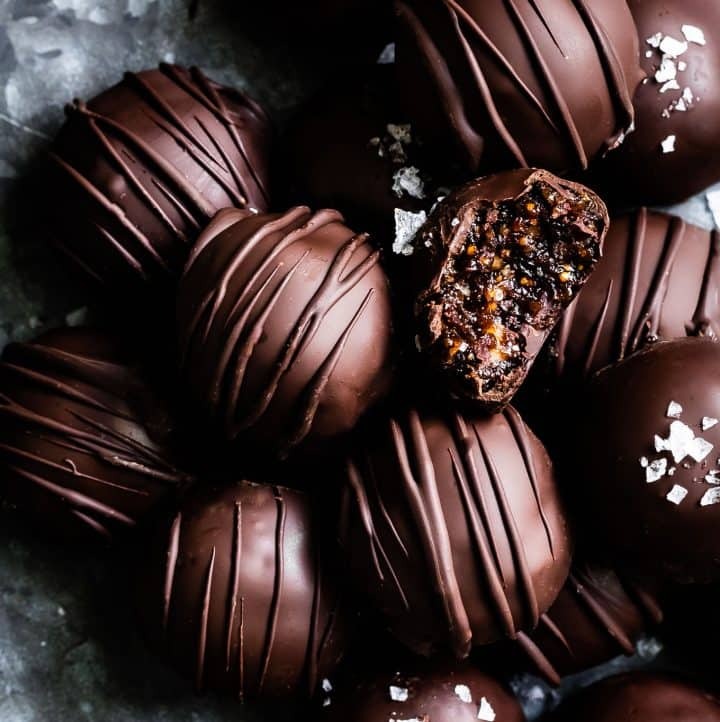 Repeat until the chocolate has completely melted. Dust the cooled cookies with powdered sugar. 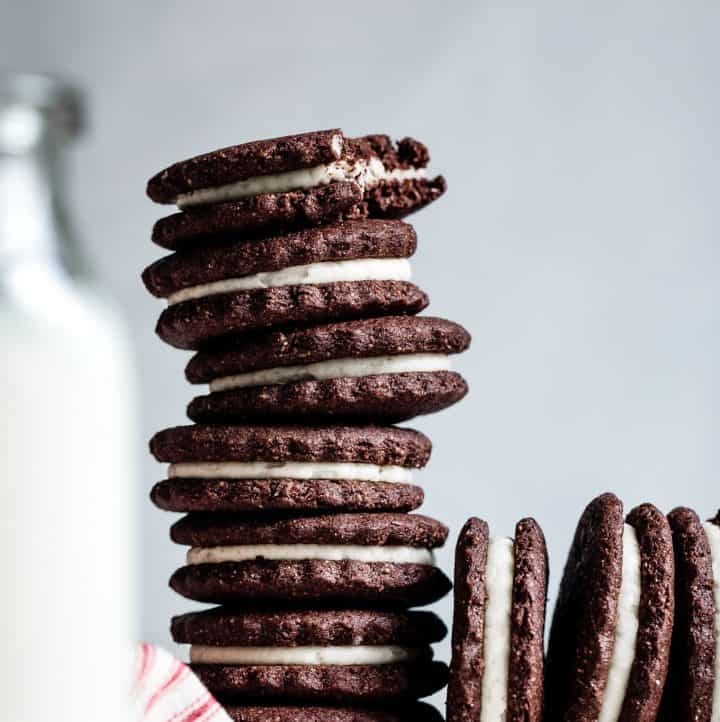 Gently dip them halfway into the chocolate, tilting the cookie to get a clean chocolate line. Set the dipped cookies on a parchment lined baking sheet to set. 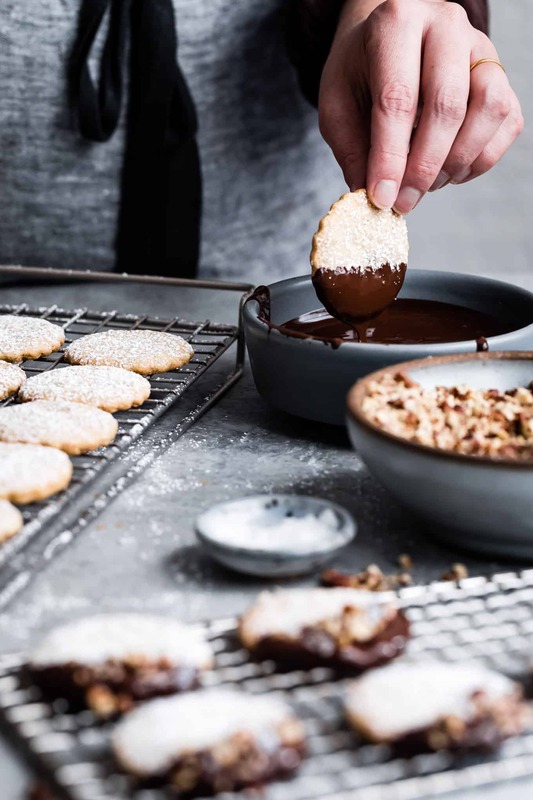 While the chocolate is still melted, sprinkle the cookies with the remaining finely chopped toasted pecans and a few flecks of flakey salt. Let the chocolate firm up before serving (you can speed this process up with a quick chill in the fridge! OMG who does that?!? Rips open their cookie box so you can try one too? What a guy. 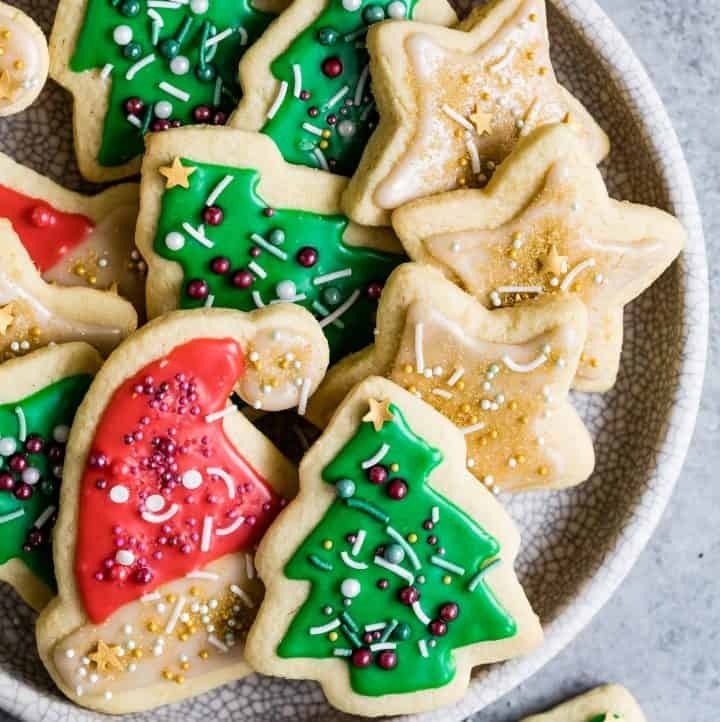 AND these cookies look stunning- need to get into Christmas cookie season. These are so, so beautiful! 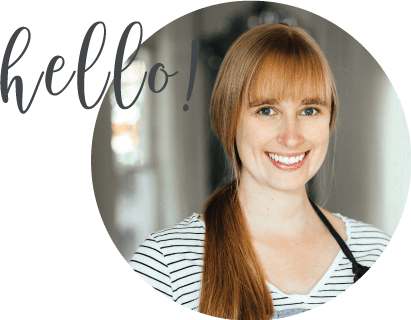 I have some gluten free friends I wanted to do some holiday baking for, and I know what is going to be top of the list! So stunning! I’m in love with the photos, and the flavor sounds so incredibly good! 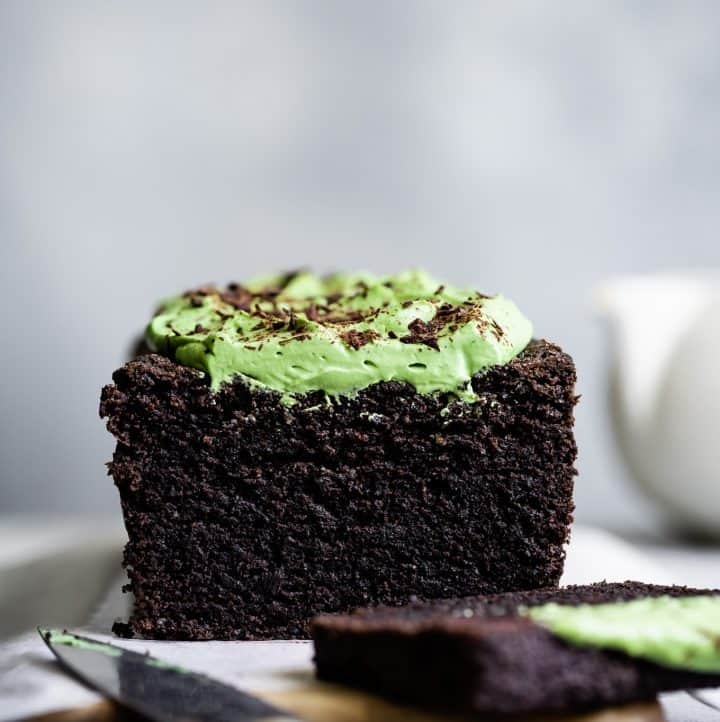 Might just have to add this to my list of things to bake in the next two weeks.